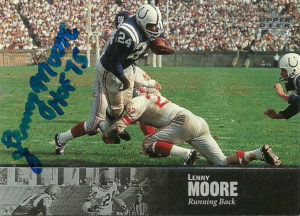 Halfback Lenny Moore was selected in the first round of the 1956 draft by the Baltimore Colts out of Penn State. After earning Rookie of the Year honors, he’d go on to play 12 seasons in the NFL from 1956 to 1967. Moore was simply one of the best players during his era, but because of the 12-14 game schedule, his numbers weren’t completely eye popping. What was eye popping was his insane yards per carry. Over his career Lenny averaged 7.0 yards or more (minimum 82 carries) 3 times (1956, 1958, and 1961). Not only was Moore a hard to tackle runner, he caught 40 passes or more in 5 of his seasons, averaging a healthy 16.6 yards over his career. As one of Johnny Unitas’ pass catchers, Moore displayed his terrific hands and ability to work in traffic, posting over 725 yards receiving 5 times (1957-1961) over his career including a then NFL positional record 938 yards in 1958, and 936 yards in 1960. Lenny endured the growing pains of NFL offenses switching positions from right halfback to flanker and back to primary halfback over his long and storied career. From 1963 to 1965, Moore scored a TD in a record 18 consecutive games. Arguably the best game of his career was during his rookie season when Lenny rushed 13 times for 185 yards and 2 TDs in a win over the Green Bay Packers. To top his career off Moore earned All-Pro Honors from 1958-1961, and again in 1964, when he won comeback player of the year honors after scoring 19 TDs. 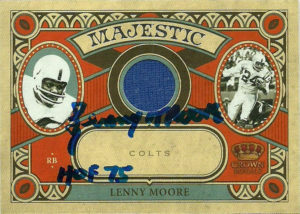 Lenny was inducted into the Pro Football Hall of Fame in 1975. Moore graciously signs for fans for a nominal signing fee of 10.00 per card. The Upper Deck 1997 Legends set is a timeless set, but I thought the Majestic had a nice composition to it. Lots of space available to frame an autograph, and the patch element was a nice piece of memorabilia to boot.